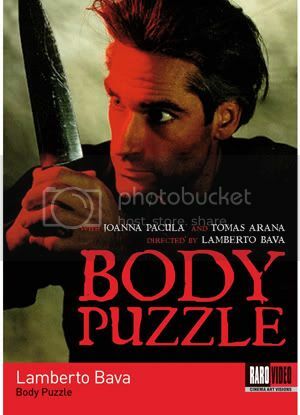 Released December 6th from Raro Video USA, is an Italian, post-giallo thriller called Body Puzzle. Directed by Lamberto (son of Mario) Bava (Demons, A Blade in the Dark), I didn't know too much about this film before watching it. I have seen a couple of Lamberto's films and this one sounded like it had an interesting plot. I am always skeptical of horror movies made after 1985 because that is when horror started moving away from the realism and into the fantastic (and ridiculous sequels). There are several films from that era that are classics but for the most part I usually aim for older films. I thought I'd give this one a shot anyway. Body Puzzle stars Joana Pacula as Tracy, a widower whose husband died in a motorcycle accident. After someone breaks into her house and puts a severed ear in her refrigerator, a detective named Michele (Tomas Arana) is assigned to the case. Simultaneously, a murder victim is found missing an ear which proves to be the severed ear's owner. Tracy begins finding more body parts left in her house, each one accompanied by another murder. After establishing that the person leaving the "presents" has a key to the house and is most likely tied to her late husband in some way (whose grave was robbed), it is up to Michele to put the pieces together (no pun intended) and find the killer before he gets to Tracy. Body Puzzle was a stylishly gory film with a surprisingly fresh story. Well thought out with lots of twists and avoiding many of the genre trappings, I would almost call this film a classic. I was very surprised (based on my snobbery of newer horror films) how much I enjoyed this, which only proves that, among other things, it's always a good idea to keep an open mind about movies and their genres. The cast all played their parts well, especially the three leads (Pacula, Arana and Francois Montagut as the killer) and there were plenty of stabbings, severed body parts and blood for us horror fans. Also, for us Italian film fans out there, there are a few noteworthy cameos that just add to the fun. Giovanni Lombardo Radice (aka John Morghen in his English friendly films), who we all know from Cannibal Ferox, Cannibal Apocalypse and City of the Living Dead, plays a gay acquaintance of Tracy's deceased husband. Also making an appearance here is Spaghetti Western legend Gianni Garko, best known as his role in many of the Sartana films. Raro's release of Body Puzzle has a beautiful widescreen transfer along with a nice, informative booklet (why can't all companies include booklets with their DVDs?). I definitely recommend this film to fans of Italian horror and giallo films.